Okay ! I do not know how to use these codes. CON in the original file, there is no such dummytile. How to determine what action is related to such a tile ? For example the monster "Liztroop" with the number # 1680. I counted to take care of one thing at a time. 1. Extract the liztroop tile (png format) of the Caribbean add-on release. 2. Add the names of tiles in a DEF file. 3. add the ART file (tile014). Notice the extra brace at the end. If you don't have the same number of left and right braces you will get an error. And always make sure to have a space before or after a brace. 1. Creat new DEF file, with tiles number to #3585, #3660. The model is the liztroop Caribbean. 2. Creat new CON files with liztroop codes and defs. 3. Creat new ART file (tile014) liztroop Caribbean. And I can not animated liztroop like the original. I sent the files that you see. Hi ! 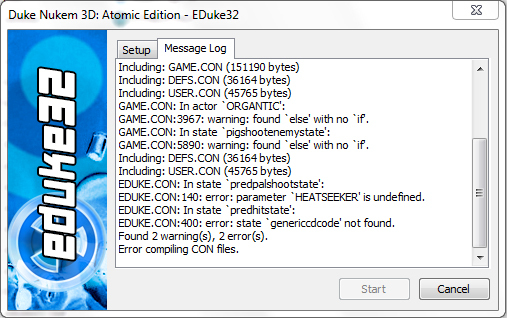 By dint of working on Duke, I learn little by little to understand the CON files. I always want to add the PREDATOR of the addo-on "The Gate"
1. Adding the file TILES018.ART and four sounds PREDATOR files to the Eduke32 folder. 2. Adding .VOC file entries in DEFS and USER. 3. And I renamed my new CON file, in EDUKE.CON (included in the list of the beginning "include" the three main files of the game). The result is only two errors in throwing the game. I do not know what the two entries are. I watched how to do it, I do not know what to add as value. If you are interested, you can buy Duke Nukem 3D 20th Anniversary World Tour on Steam. It has a new episode by the original developers. In the meantime the Duke Nukem 3D Total Meltdown TC had been released as well. Hello ! Thank you but I have already tried to play, but the game refuse to start. And I no longer use Steam support. Do you have an idea for my problem? It looks like you've got a new projectile (EDIT or more likely, actor) labeled HEATSEEKER that is undefined. It's possible that the label and the projectile are defined elsewhere, but the relevant definitions are not being loaded, or at least not being loaded in the right order. Beyond that, it's completely impossible to say, since you are obviously using customized CON files that we don't have. The action "heatseeker" is linked to the enemy PREDATOR of MOD "The Gate"
Hello ! It was a long time since I had not taken this topic again. Recently, I'm helped a lot on the programming of new monsters and new textures and it's progressing very well. I have some other problems, however, and I'll let you know, for more help. Fox, Hendrick and Mark have already given me a good foundation. 1. not all colors spritepal are recognized by the monsters of the PSX version. Whether it's the frozen enemy or the night vision, nothing is recognized in the game. 2. Fixed monster that can not be hurt or killed at a distance (for a surprise effect), without being awakened before (possible with the original monsters). 3. Question! Is there a code for the size of the monsters that is instantly recognized on the map, not when they see Duke ? For exemple EVENT_LOADACTOR ? 4. The Zombie Pig Cop does not die the first time, in a tense trap (with the pipe-bomb). 5. Monsters hang in walls during the routine. They can not manage to use narrow passages like corridors. 6. The jetpack sound of a Liztroop is played without end, when the routine of an enemy is normally over. 7. The Liztroop toilet generates a double recognized sound without explanation. 8. Finally, I could not change the CyberKeef health point. Hello everyone I have a problem with my new monsters. When I create a narrow passage, monsters can not make these passages. When I place a monster in a narrow passage in Mapster32, it hangs in a wall when it is awake. Is it a cstat or a value like ifnotmoving? The original monsters pass without problem in these narrow passages.